After a lot of testing, tweaking and fixing version 2 of rkSmartPath is available. 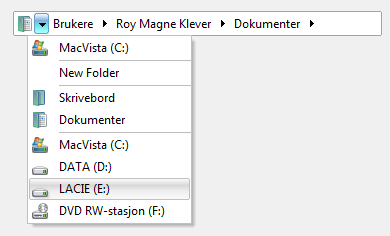 What is rkSmartPath: it is a component for Delphi that will allow you to navigate the filesystem similar to explorer in Vista. Folder path is represented as buttons and arrows. Pressing a button will allow you to set that path, pressing an arrow will let you pick a folder in that folder. Try the demo and you see what I am talking about.